-Prepared by Wise Preservation Planning in February 2004. Click on the underlined sections of the document below to open a PDF file. Some of these PDF files are large and may take several minutes to open depending on the speed of your internet connection. This historic structure report documents the Isaac Hunsicker House, located at 4062 Heckler Road in Skippack Township, Montgomery County. 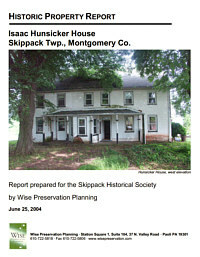 The report was prepared in May-June 2004 by Wise Preservation Planning, Paoli Pa. for the Skippack Historical Society. Wise Preservation Planning is a full-service historic preservation planning firm specializing in, among other things, research, analysis, and documentation of historic resources. The report consists of an extensive executive summary with recommendations, an architectural description of the Hunsicker House, a historical overview, and a condition analysis. The executive summary and recommendations section was produced for the Skippack Historical Society prior to completing the report at their request. It provides a brief overview of the project, the building’s history, and most importantly, detailed recommendations on how to approach the rehabilitation of the Isaac Hunsicker House. While these recommendations would normally exist as a separate section, we have elected to leave the executive summary intact. The subject property is located at 4062 Heckler Road, one mile south of the village of Skippack in Skippack Township. The tax parcel is 51-00-02875-008. The property has a gently sloping, open topography that generally drains to the east. The former farmland immediately south of the house (subdivided from the subject tract) were undergoing residential development at the time of this study; of the sixteen acres associated with the house in the late twentieth century, fifteen will be developed. The only historic resource on the property is the Hunsicker House, as all agricultural outbuildings have been demolished. The Hunsicker House is a multi-additive building facing roughly west-northwest and oriented perpendicular to Heckler Road. It consists of a two-part main block with a two-part wing on the south end. The house has roughly 3,200 square feet of space: 1,664 on the first floor and 1,551 on the second floor plus additional basement and attic space. The ground rises to the west, allowing a basement door on the east elevation of the north section to open onto grade. A mound approximately five feet in diameter just west of the house indicates the location of a well, no longer in use. In the following detailed description, the exterior of the Hunsicker House is described first, followed by a description of the interior. The exterior description begins with a general description first, followed by a detailed survey of architectural elements from the top down. 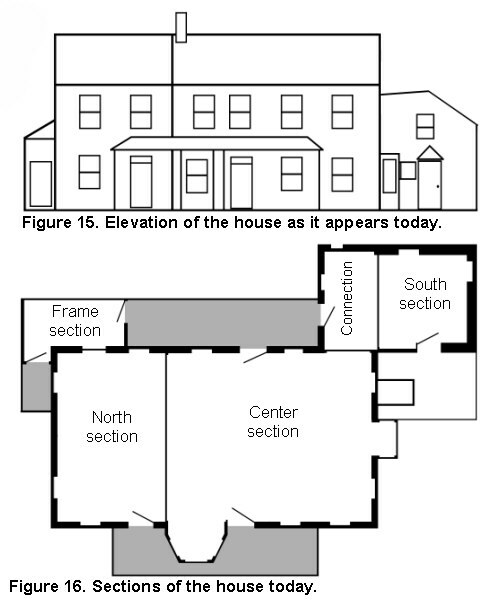 The Hunsicker House is comprised of a two-part main block, a two-part south block, and a frame section (See Figure 1 and Photo 1). Its overall dimensions, including all sections and porches, are 69’x50’. The main block is comprised of a two-story, four-bay brick center section (c. 1834) and a two-story, two-bay stone north section (c. 1845). The south block is comprised of a two-story, two-bay stone south section (c. 1770) and a two-story stone section that connects the core to the main block (c. 1845). Twentieth century alterations to the south section have obliterated many architectural details which would otherwise convey more of its history. The one-story frame section dates to the early twentieth century and is an enclosed portion of the porch on the east elevation. Interior modifications to the various sections have obscured or eliminated some architectural details, particularly in the south section. The interior of the House has two floors plus attic and basement levels. In the early twentieth century, the house was divided into three apartment units. One unit occupies the north section, one the bulk of the center section, and one the south section and the southeast corner of the center section. The following description describes the interior of the first floor, followed by a description of the second floor, attic, and basement. Much of the history of the Hunsicker House is associated with the Hunsicker family, which owned the property from the mid-eighteenth century until 1926. Valentine Hunsicker (1700—1771), an immigrant weaver, moved to the Pennsylvania colony in 1717 to help construct the Mennonite Meeting House in Skippack Township. Hunsicker settled near the meeting house around 1720 and was active in the Mennonite community. Naturalized in 1731, Hunsicker purchased several parcels of land in Skippack Township and constructed a house. He and his descendants became leaders of the Mennonite community.